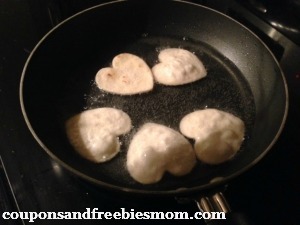 Looking for a yummy treat to make for Valentine’s Day or just because? 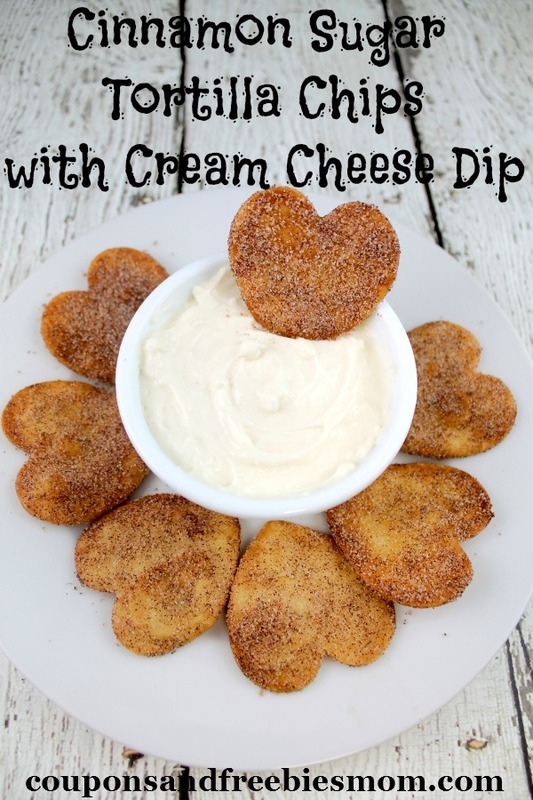 Here is a super cute and fun Cinnamon Sugar Tortilla Chips With Cream Cheese Dip Recipe that is sure to be a hit. Pick up some fun shaped cookie cutters to make the tortilla crisps perfect for your event or party and whip up this yummy dip. Make sure to make a double batch because these will be sure to disappear fast! In a medium size pan, melt just enough coconut oil to have 1 inch of depth to fry. Using a cookie cutter or knife, slice your tortillas into desired shape and size. In a bowl combine sugar and cinnamon and set aside. Place 4 -5 (depending on the size of pan) into oil and cook on each side for 1 minute or until golden brown. Once tortillas are done frying, tap off any excess oil and immediately dredge them into the cinnamon and sugar mixture, coating well. In a large mixing bowl, combine cream cheese and cool whip. Add in vanilla extract and sugar until well incorporated. This snack is such a great treat for the kids. Kids love fun shaped snacks and you can use any shaped cookie cutter even dinosaurs or cars! Make this Cinnamon Sugar Tortilla Chips with Cream Cheese Dip dessert and snack for your family this weekend and they will be begging for more! Don’t miss all of our great Recipe Posts for more great snacks! Yum! Thanks for sharing this great recipe, I can’t wait to try it.